Zoya’s PULSE Collection came out a while ago and I have had it on backorder for 2 WHOLE MONTHS !! It’s nearly killed me waiting for it to arrive. 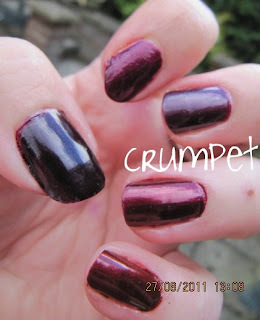 It’s full of dark, deep, hypnotic colours with a little bit of metal and shimmer thrown in for good measure. Sounds like heaven ! These colours are GLORIOUS. They are dark, they ARE hypnotic, they are mysterious, dramatic, perverse, subversive, evil – everything a classic dark polish should be! Let’s start with the thumb – SLOANE. 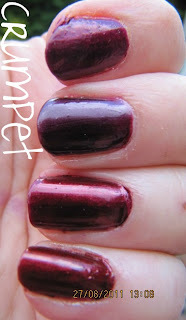 Described as “black plum metallic” Sloane is going to be getting a lot of wear this winter. I think she’s more like blackcurrant skin, and it wasn’t til a sunbeam hit us that I saw the teeny tiny sparks of metal glinting under her surface – she’s like a super spy keeping that secret! I love this. A lot. Index finger = RIHANA, a “raspberry wine metallic”. This is like burgundy without the brown – a nice dark shimmer, not unlike red wine. I don’t know that I would call it raspberry – it’s a bit darker than that. I think she will look a-may-zing with glitter. On the middle finger, MIKKA, an “icy grape metallic”. There is a lot of kinship between this one and Sloane. They are both from the Grape family, but this is a little bit lighter and has a lot more going on as a result. She sways and shimmers, bends and blinds you – this is pure dark beauty. 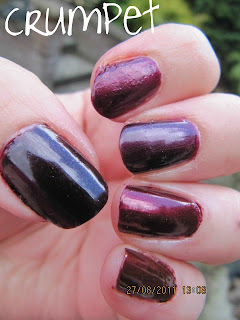 Ring finger is BLAIR, an “elderberry plum metallic” and this is the first one I didn’t love as much on the nail as I thought I would. 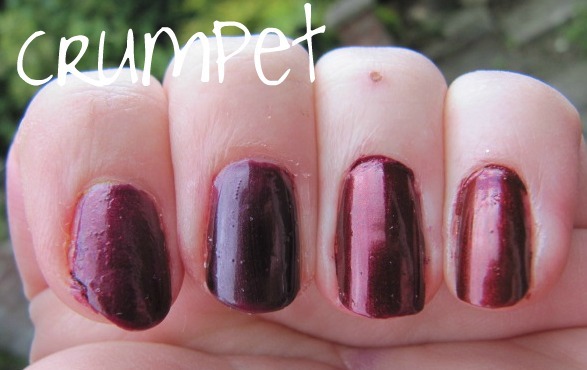 In the bottle, she’s a shimmering swirl of hot-headed rubiness, but veers towards maroon on the nail. I don’t know where all the brown suddenly came from. She’s not ugly, not by a long strange, but I would have liked the red to dominate a little more. Finally on the pinkie, COLBIE, a “russet metallic” – perfect description. This is a bit lighter and browner than Blair, giving an intense blackened copper look. Again, these 2 are very close sisters, and given the choice I would probably keep Colbie as she looks like Autumn leaves. So, Sloane, clear winner, then Mikka, possibly the unphotpgraphed Jacy, then Rihanna, Colbie and Blair. All beautiful girls – bring on the dark skies and these girls will be good to go. Purple Water Marble - Happy Birthday to Me !!! Nail Fun - Fiiiiiiiire ! 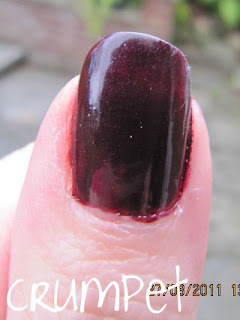 Nail Fun - The Volcano! Nail Fun - Franken Time !! Raindrops? Pah! Oh, THAT’S Why You’re Rioting …. 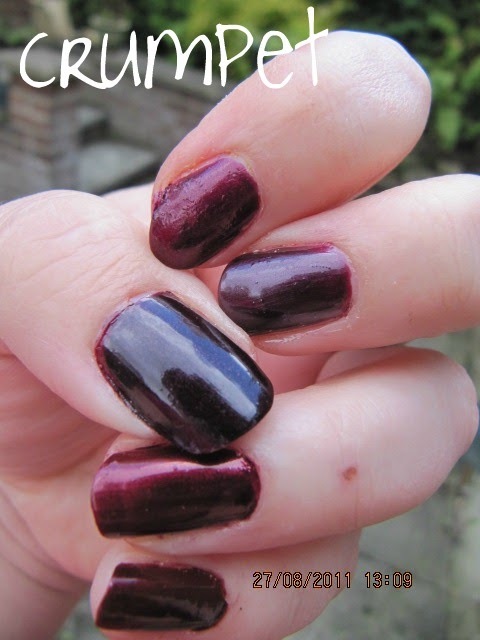 10 Things I’ve learnt about Nail Varnish ….